Lets talk about something near and dear to everyone’s heart… PIZZA. If you do not love pizza you are no friend of mine, and are probably a direct descendant of Adolf Hitler himself. If you’re one of those fruity wing nuts that thinks pineapple and ham is good on a Dominos pizza, your bloodline is weak and you will not make it through the winter. What I’m getting at is there are many different types of pizza. I grew up down the street from Max’s Pizza in Bristol, I still go there, it’s Greek pizza, some are not a fan but it is nostalgic to me. There’s the New Haven Pizza, the Pepes, Sallys, Moderns, Bars, Da Legnas and Zuppardis. Then you have new wave artisanal brick oven pizza, like Vero in Plainville, or Krust in Middletown. Today’s review will concentrate on the latter. A few weeks back after a strenuous day of moving, I decided to treat myself to a dinner at someplace special. After a long day I trekked the 40 minute drive to Chester, CT and sat down for a meal that provided the best salad, pizza and dessert of 2016. This gem of a meal was at Otto Pizza in Chester, CT. I am still reeling from how good this was, and the people running the place were so humble, putting the food first and paying no mind to the fact that they pump out perfection daily. Like, I want to go back NOW. I would expect nothing less from a place that partners themselves with the beautiful people of River Tavern and Dinners at the Farm. So this fabled magical salad, lets discuss. 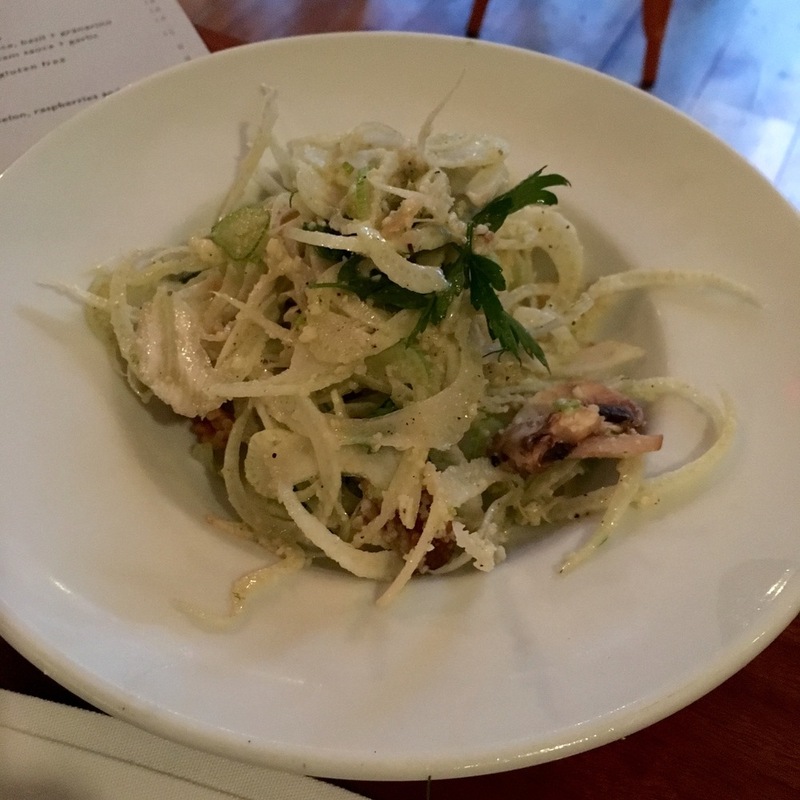 Shaved fennel, walnuts, granarino, mushrooms, mint and parsley. I’m not exaggerating; this was the best salad I’ve ever had in my life, and mind you it had no meat. So simple yet perfect. Mint with the parsley and fennel was very interesting. Granarino, aka mystery cheese, does not exist on the internet so I’m going to trust my palate and say this is close to a grana padano or hard ground parmesan, so insanely good. Next was pizza time! The first was something I had seen on Otto’s Instagram. Pepperoni, fresh mozzarella, scamorza, chilies, rosemary and garlic, this pizza was easily the best I’ve had in a long time, so my hat goes off to you guys, truly perfect. The chilies were places inside the pepperoni so when cooked, the pepperoni curled up and the chile sat in the middle of the meaty blossom! IDK where this pizza chef studied but I want him to adopt me, my parents would completely understand. After downing a couple slices I couldn’t contain my cravings, I needed another pizza! I asked the server what his favorite was and he suggested the nduja, ricotta, arugala, rosemary, garlic and granarino. This was the perfect WHITE pie. For those that don’t know, nduja is a particularly spicy, spreadable pork salume. It is typically made with parts of the pig such as the shoulder and belly, as well as tripe, roasted peppers and a mixture of spices. If you haven’t tried a dish with nduja, you need to. It was now time for dessert, and something caught my eye when I first saw the menu, a ricotta dessert. The other two desserts were tiramisu and a root beer float, but my heart was craving the ricotta. Once I explain this dessert you will understand why I selected it. Ricotta with crushed amaretto cookie, blueberries, watermelon, blackberries, pineapple and lemon zest glaze, almost honey-like. 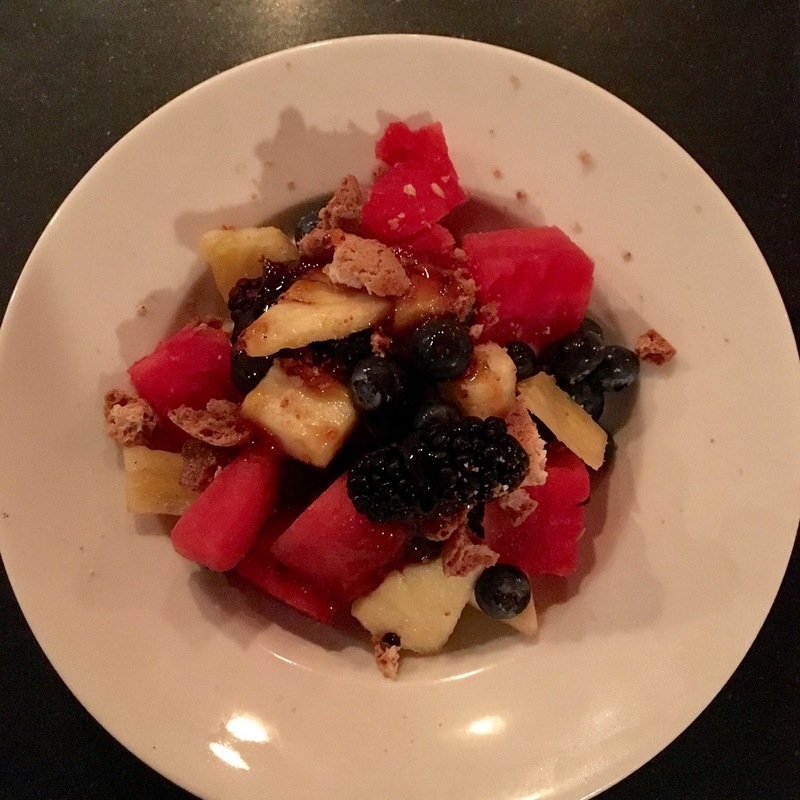 As simple as it was, a bowl of sweet ricotta and fruit, this was my favorite dessert of 2016 by far and the perfect dessert for a hot summer night. I left Otto full, satisfied, not bloated, not feeling gross, content and happy for once. Otto has a nice wine selection, craft beer list and serves Avery’s soda if my memory is working. Thank you OTTO PIZZA, you can do no wrong in my eyes and I WILL be back very soon. This has been another edition of BENN BREAKS BREAD. Thanks for reading, and follow me this week only as I takeover the EAT IN CT instagram page, ending the week with a drink at Little River Restoratives and a new post from the interview I did with co-owner Chris Parrott.